Someone once told me the only way they would run was if a dog was chasing them. Ironically after more than nine 5K races and two half marathons, they have become a recreational runner. They started with just walking and then slowly adding short periods of jogging into their walk. Over some time, they began to enjoy the benefits of running. You have often seen individuals running in the community seemingly so graceful and with ease. Somewhere deep down inside, you wish you could do that, but if you’re like many people, it seems almost impossible. Unlike lifting weights or basketball or skill related activities, no equipment is needed to take a jog (or even a brisk walk). Running is an activity that is always accessible. That means you can start anytime and anyplace with just a regular walking routine. Over time, you can add short bouts of jogging until the short bouts become longer. The more you do this, the better you will become. The great thing about this is you can practice anytime and anyplace you choose. No reasons to fret when you see your physician and they bring the blood pressure cuff out. You can gain control of your blood pressure with a regular running routine. The top number of your blood pressure (systolic) is typically reduced by 4 to 9 millimeters of mercury (mm HG) for those who get regular exercise. Better yet, regular aerobic exercise can prevent rises in your blood pressure as you get older. Tired of those blood pressure medications? Why not have a conversation with your physician to work together towards running those pills away? There are chemicals in the body that are called stress hormones (ex. adrenaline, cortisol), but there are also some that are mood elevators or “feel good” hormones (ex endorphins). A good run gives that moment of escape, the mental relaxation and the release of endorphins to help reduce your stress. Very often, the stress relief that you need is not only in finishing the last part of that project or task you are working on, but in taking a break from it, going for that run, and then coming back to it. The same hormones that reduce your stress also give you more energy. As you gain the benefits of better sleep from running, you will wake up with more vigor and more focus. Regular running has multiplying effects. Every time you use energy to do it, you gain more energy back than you used to do it. If you feel like you are tired all of the time, why not giving running a try. Runners of all levels often create communities. This is a great opportunity to meet someone new with an already established common interest. Companies such as Fleet Feet often have training programs to help people learn to run in small groups. Even signing up to walk or jog during a local 5K event brings a great opportunity to experience the fun of meeting new people in a pressure free setting. You live longer and healthier. The National Institute of Health did a research study that shows that even those who start running at middle age, can reduce future disability and live longer, healthier lives by running. Running is a great investment in your health. 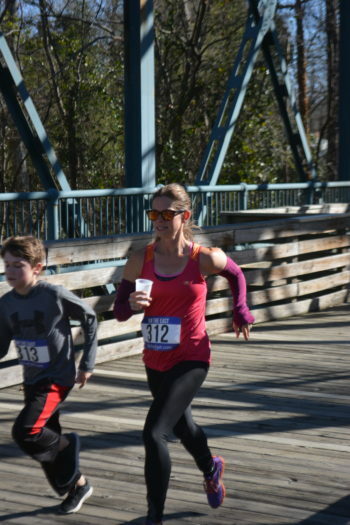 Whether you start young or old, your body can adapt to the positive changes of running so that you get better and better at it. There is nothing like maintaining your mobility that makes you feel free as you age. So give it a try! Start out with a brief walking program that will progress over time to get you on track to be a regular runner. Of course, it is always advisable to consult your physician or physical therapist when starting a new program. It turns out our furry friends have more to offer us than companionship and unconditional love. Multiple studies actually show that dog owners are generally healthier and more likely to meet national fitness benchmarks than non-owners. A 2013 study published in the Journal of Physical Activity & Health showed that dog owners take an average of 2,760 more steps per day compared with those who don’t have dogs. This amounts to 23 additional minutes of moderate exercise per day. Another more recent study published in 2017 by BMC Public Health backs these numbers. I don’t know about you, but my Fitbit loves those added steps. According to the Centers for Disease Control & Prevention (CDC), adults should get at least 150 minutes of moderate-intensity exercise (i.e., brisk walking) each week. And of course, achieving such benchmarks help individuals improve and maintain long-term health – both physical and mental wellness. Walking is one of the best physical activities nearly anyone can do, and, taking a dog out for a walk often makes the activity more enjoyable and feel less like exercise – less like a chore. Pets require lots of love, care and responsibility, and simply having one isn’t going to immediately make you a marathon runner but, if you love animals and could use some added motivation to get outdoors, dogs have a way of pushing you in that direction.